What a ride. England’s finest performance at a World Cup since 1990, and the joint-best result ever beyond our own shores, finally came to an end on Saturday afternoon, as a 2-0 defeat to Belgium brought the curtain down on a dramatic, emotional but above all hugely positive month in Russia. 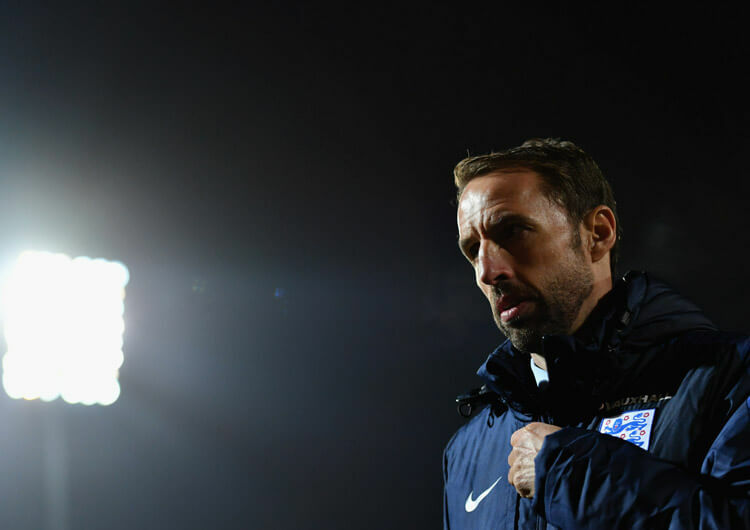 Gareth Southgate and his squad have rebuilt the England team’s relationship with both fans and media, and can look to future tournaments – both Euro 2020 and beyond – with an optimism built on a solid foundation of talent, organisation and potential. 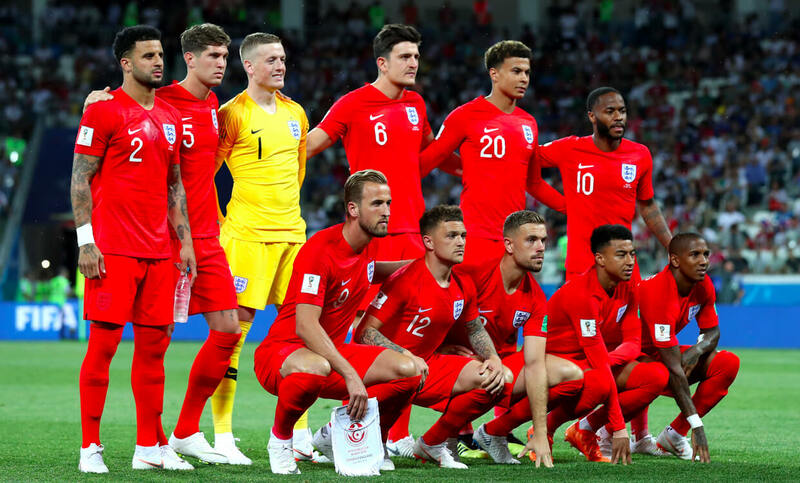 The semi-final defeat to Croatia and closing loss to Belgium only served to underline the work still to be done to turn England into a team consistently able to challenge for major honours, however. But what have we learned from their Russian adventure? Here, our professional coaches analyse how Southgate set up his team, and consider what we saw from new-look England, game by dramatic game. Perhaps thanks to Steve Holland’s experiences under Antonio Conte at Chelsea, England decided to head into the 2018 World Cup utilising a defensive back three and accompanying wing-backs. An immediate concern with this shape was the lack of left-footed players throughout the defensive unit, and indeed the team in general. Of the nine defenders selected in the England squad, only Danny Rose was naturally left footed – and his qualities were always far more aligned to the wing-back role. Gareth Southgate thus had to go with an entirely right-footed back three, with the converted Kyle Walker, John Stones and Harry Maguire the preferred trio from right to left. Jordan Pickford was selected as the number-one goalkeeper, mainly for his ability to restart play with the ball at his feet, coupled with a capacity to accurately hit long passes on both sides. From a strictly goalkeeping perspective, little separates Pickford from the squad’s other two stoppers – Jack Butland and Nick Pope – as shot-stoppers. All three had extremely busy seasons with their respective clubs, which was reflected in them all making the top six for saves during the 2017/18 Premier League. From this defensive base, England set up with two flying wing-backs to provide attacking height and crosses from the channels. England’s lack of ball-playing central defenders meant Walker was ruled out of the wing-back role, with Kieran Trippier cementing a starting spot. Injury and fitness concerns ensured Danny Rose was only a substitute, with Ashley Young – another right-footer – deployed as the preferred left wing-back. Ahead of them, the midfield was set up to allow both Dele Alli and Jesse Lingard the licence to run in behind, while not suffocating one another in possession when offering short. England had lots of central space as the advancing wing-backs stepped into the next line of play, thus horizontally stretching opponents to a maximum. With Jordan Henderson acting as a lone pivot, England had a reversed central midfield triangle base when in possession. In attack, talisman Harry Kane was accompanied by Raheem Sterling – a rare strike duo, with many teams setting up with a lone central forward. The selection of two forwards enabled England to pin back opposing central defenders, creating further space for the central midfield. Kane in particular often dropped short, dragging his marker to provide space in behind for Alli, Lingard or Sterling to penetrate. The aim was to create fluid attacking rotations all across the pitch, utilising a possession-based approach where possible. Defensively, Jordan Pickford was more than capable of coming for crosses and set-pieces, despite his apparent lack of height and reach. He added security at England’s defensive set-pieces and, of course, saved a crucial spot-kick in the last-16 shoot-out victory over Colombia. The back three were solid when defending one against one, while Stones and Maguire’s aerial presence provided stability from crosses and set-pieces. Walker’s lack of central-defensive experience showed more than once, however, as he was caught out from crosses against both Tunisia and Croatia. His natural body shape as a full-back was exploited as he was required to tuck around far more than he is used to, enabling attackers to move blindside and attack the ball at pace. That said, Walker’s trademark pace and speed on the defensive transition ensured England were rarely punished from opposition counter-attacks. In midfield, Henderson, Lingard and Alli formed a central trio, while the two wing-backs recovered back into the last defensive line, forming in essence a back five behind a tight central midfield three. 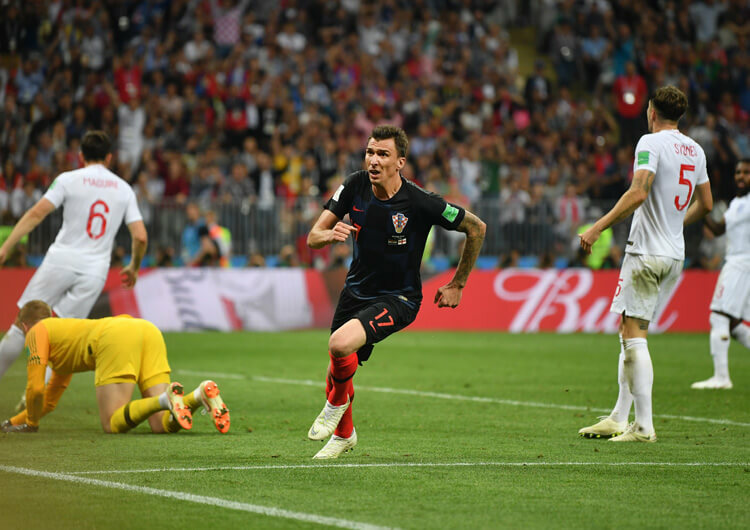 From here, England lacked cover in the wide areas, as opposing full-backs had ample space to drive forward – witness the display of right-back Sime Vrsaljko in the semi-final defeat to Croatia. The protection of the central lane was justified, as the majority of teams failed to centrally penetrate England’s block. However, this defensive set-up could be exploited from switches of play, and subsequent attacking crosses, especially from England’s left. Walker was clearly targeted as teams tried to avoid both Maguire and Stones in the air. Throughout the tournament, England often left Kane and Sterling high, ready to transition into attack. Despite this proactive approach, England often looked overrun in midfield; with multiple games in such a short period, a more shared defensive workload across the starting XI could have seen England benefit. As the tournament progressed, England faded much earlier from match to match. They generally peaked within the first half and gradually waned – particularly with the quality of opposition increasing from game to game. Unarguably the most successful aspect of England’s play throughout the World Cup was their effectiveness at attacking set-pieces – in particular their potency at corners. The inclusion of Young and Trippier as wing-backs also provided England with two superb set-piece takers. Trippier’s free-kick against Croatia in the semi-final was a fine example of his dead-ball talents, with Young also providing real quality from the left side in particular – most notably with the assist for Harry Maguire’s bullet header against Sweden (above). Generally attacking with six players inside the penalty area, primary targets Kane, Maguire and Stones were all extremely dangerous in the air. A variety of delivery and movements from the core attackers was also crucial to England’s success in this area, together with the occasionally crucial blockers. These tended to be the less obvious aerial threats of Lingard, Alli, Sterling and Young, when not charged with the delivery himself. These roles are crucial to disorganising the opposition markers, and providing more space and freedom for the powerful headers to attack the ball. It is worth noting that set-piece routines are much quicker to master than structured principles of play, and complex pressing or attacking systems. With limited time prior to the tournament, Gareth Southgate and his coaching staff clearly decided to use it wisely, and focus on this aspect of their game. It certainly reaped rewards, with nine of England’s 12 tournament goals stemming from set-pieces. England’s dominant first-half spell was arguably their best period of the entire tournament. Their six shots on target in the opening 45 minutes was their highest in a World Cup game since 1966, but their lack of a killer instinct – they somehow went in 1-1 at half-time – was a concern. England’s success mainly came down to the exploitation of a poorly constructed Tunisian back line. In the first half, Tunisia set up with a back four but couldn’t handle England’s fluid rotations within what was essentially an attacking front four. Tunisia changed to a back five for the second half, however, and England’s failure to adapt to this change set a tone for the rest of the tournament. It was a trick Nigeria had pulled in a pre-tournament friendly, when England’s failure to adapt to a shift from a back four to a back five saw them go from complete control to relative instability. Up against a newly formed back five here, England lost their central penetrations. 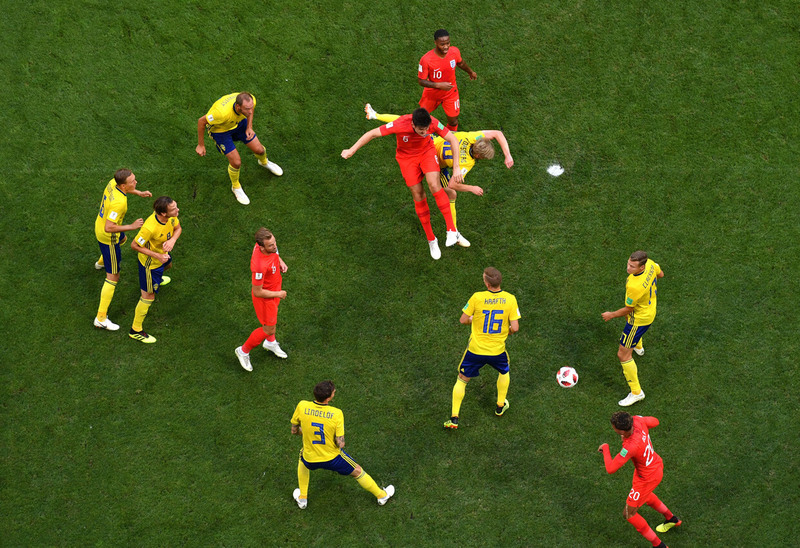 Jordan Henderson was aggressively man-marked, as England’s only central midfield link from defence into attack was choked out of the game (above). From here, both Harry Maguire and Kyle Walker were afforded space within the inside channels to progress the ball with direct dribbles forward. However, neither enjoyed any real options ahead of them with little or no movement in behind from Alli, Sterling or Kane, who gradually dropped further and further away from the penalty area. England eventually secured three points thanks to an impressively worked corner routine, but their failure to adapt to opposition changes would remain a key trend throughout Russia 2018. Alli’s obvious injury was also a concern, with his early penetrative forward runs grinding to a sudden and obvious halt. An effervescent England showed great ability in between the lines against an admittedly dreadful Panama defence – one of the worst and most ill-disciplined in World Cup history, in truth – but their biggest ever World Cup win owed much to well-planned and beautifully executed set-piece routines. Their fourth goal – an exquisitely orchestrated free-kick that eventually led to John Stones nodding in from close range – stole most of the headlines, but it’s also worth noting the approach that led to Stones’ opener. England set up at an attacking corner with an unusually high number of players in the penalty area. The majority of teams will attack with four or five runners, but England had six players entering the box, with Ashley Young making it seven just on the edge of the area. The main targets clustered together, hoping Panama would struggle to track every run effectively and that at least one England player would break free. Stones’ crucial run from deep generated the power required to score from a header – it is unlikely he could have scored from a standing start – but Young’s role on the edge of the box was vital. His clever positioning away from the referee’s eyeline (see the top right panel, above) did just enough to block Stones’ marker. From here, the remaining England players inside the penalty area dispersed, creating the perfect gap for Stones to charge through and bury his header. During the first half of their final group game against Belgium, England’s much-changed side demonstrated their strength in depth with regards to building short from the goalkeeper. Jordan Pickford and John Stones were the only two to remain as part of England’s defensive unit, with Gary Cahill and Phil Jones filling in at central defence and Danny Rose and Trent Alexander-Arnold selected at wing-back. 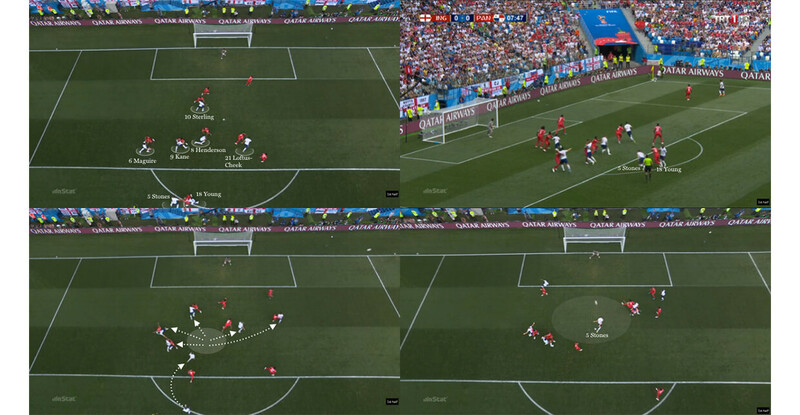 Through that opening 45 minutes, England were able to exploit Marouane Fellaini’s lack of positional sense. Eric Dier took over from Jordan Henderson in the pivot role and generally connected well with his back line, if not with those further forward; luring in Fellaini opened up England’s right side (above), as Gareth Southgate’s men consistently built short from the back against their first genuinely high-pressing opponents. Things changed in the second half, however, as Fellaini and Belgium altered their approach. Michy Batshuayi continued to aggressively press Pickford, but Fellaini remained on Belgium’s left side, rather than attaching on to the central Dier. From here, England could and should have built using central passes, finding Dier in the most space he was afforded all game. However, England and Pickford in particular decided to utilise more direct and longer passes into attack. The patient first-half approach that created opportunities for England vanished, as they succumbed to a 1-0 defeat that confirmed second place in Group G and, of course, saw them enter the ‘easier’ half of the draw. England’s first knockout match saw them battle a combustible Colombia, who altered their tactics. With star man James Rodriguez not fit enough to even make the bench, coach Jose Pekerman shifted from a 4-2-3-1 to a 4-3-2-1, adding solidity in midfield and looking to Juan Cuadrado and Juan Quintero to overload the Colombian right. This set-up enabled good England progress through arguably their most consistent performer of the tournament: Kieran Trippier. The Tottenham full-back’s six key passes were the most from anyone on either side, with four in the first half creating good openings for his front line. The movements of Jesse Lingard and occasionally Kyle Walker helped take Colombian left-back Johan Mojica away from Trippier (above). From here, he provided good crosses into the penalty area, with Spurs teammate Kane unlucky not to see his looping header drop into the far corner. Trippier’s influence dwindled as, once again, England’s opponents amended their shape in the second half. Colombia’s change into a 3-5-2 that mirrored England’s formation forced Trippier into additional defensive work, as it was Mojica’s turn to advance forward for Colombia. England’s best attacking outlet was reduced from a marauding wing-back into a deep and defensive full-back. Once England regained a measure of control, Trippier resurfaced with a clipped ball towards the far post from which Dele Alli headed over – an identical movement from Alli would prove fruitful against Sweden in the following game. Trippier’s impact on the game for England and the tournament as a whole cannot be underestimated. His defensive resilience, coupled with his superb crossing and set-piece delivery, has brought new life to England’s right side. In this match alone, his corner led to the penalty that put England ahead, and it was his nerveless penalty that brought them level in a shoot-out they so dramatically went on to win. England booked their place in only a third ever World Cup semi final with an extremely solid central defensive display. Another fine performance from Jordan Pickford in goal secured the team’s first and only clean sheet of the tournament. Between them, John Stones and Harry Maguire won 20 of 22 aerial duels. The aerially weaker Kyle Walker wasn’t exploited as much as he might have been, with 75 per cent of Sweden’s attacking crosses coming from the left channel and thus aimed towards the centre or right of England’s area, with Viktor Claesson moving in off the right flank to attack centrally (above). Sweden looked to suffocate the box with bodies, but Stones and Maguire remained resolute. Both central defenders were also excellent during Sweden’s build, as they searched for early and direct balls into striker Ola Toivonen. 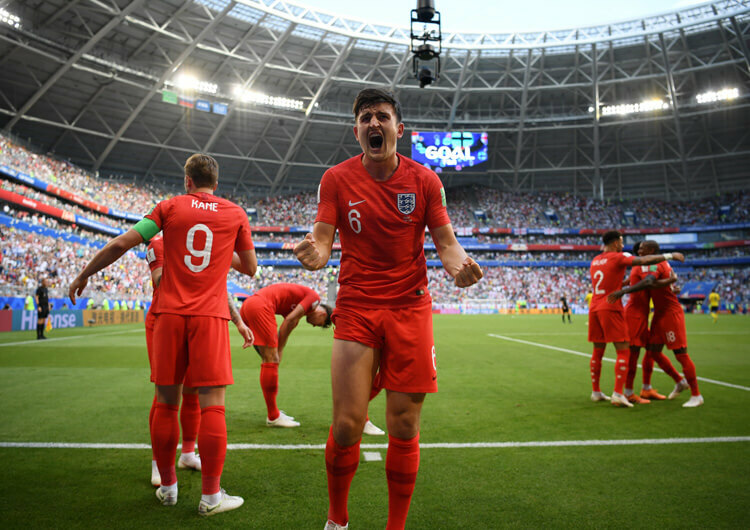 England’s slow start ensured Maguire and Stones remained busy in the opening exchanges – 12 of their 22 aerial duels occurred in the opening 20 minutes – but as England began to assert and take control of possession, Sweden’s directness with the ball faded. In the second half in particular, Pickford made three excellent saves to maintain England’s lead. The first came from a powerful Marcus Berg header, as the Sweden front line finally connected with one of their left-side crosses. Berg isolated himself on to the diminutive Ashely Young, and despite powering his header on goal, Pickford superbly palmed it to safety. His second and third key saves came after England had grabbed their second goal, both ensuring England’s two-goal cushion remained intact as Sweden combined well to slice through England’s tiring midfield. However, the back line held out for a deserved yet overdue clean sheet. England’s second-half drop in performance continued and, ultimately, cost them a place in the World Cup final. Despite largely dominating the majority of the first half, England’s failure to change their tactics when it was desperately needed allowed the Croatian midfield to take control of the game, and thus the result. England’s central passing was initially proving effective, both after prolonged spells with the ball and during moments of transition. Croatia’s single pivot, Marcelo Brozovic, was comfortably outnumbered and unable to halt England’s progress with the ball. The ability of England’s back line to break lines contributed to this, with both Stones and Maguire splitting Ivan Rakitic and Luka Modric with accurate deliveries through the Croatia midfield (above). The movements of Dele Alli, Jesse Lingard and Raheem Sterling were fluid, organised and efficient. England created good chances from distance, but slightly struggled to really break into the Croatian box, just lacking that final pass to penetrate. This all changed after half-time, again, with Croatia dropping Rakitic alongside Brozovic to create a two-on-one structure against Jordan Henderson, allowing Luka Modric to move forward and conduct proceedings in a more advanced position. This, coupled with Rakitic’s accurate switches of play from deep, earned Croatia full control of both the second half and extra-time. They exploited England’s lack of cover in wide areas, as Alli in particular struggled to cover the ground – a possible legacy of the injury he suffered in the opening game against Tunisia. England’s first-half display in what is always a strange fixture lacked real purpose and quality in between Belgium’s lines. With multiple changes, England had too many players behind the ball. Those ahead of the ball were struggling to connect as they were overloaded and outplayed by the Belgium defence. Fabian Delph and Eric Dier acted as a double pivot, but neither are willing runners in behind and lack the ability to drive forward with the ball through tight spaces. Ruben Loftus-Cheek was often the only passing option available, as Raheem Sterling also dropped short toward the ball from a higher starting position (above). Even when England did work the ball into Loftus-Cheek, the next pass was lacking as limited options hampered England’s progress. In the first 45 minutes, England lost possession 12 times between Belgium’s midfield and defensive units. Compare this to the second half, where they only lost the ball four times in the same area; for perhaps the first time in the tournament, England’s changes added discernible threat to their attacking play. As Delph moved to left wing-back, Southgate added Jesse Lingard and Marcus Rashford centrally, with Eric Dier remaining as a lone pivot. Belgium dropped off into a deeper defensive shape in the second half, which definitely helped England’s progress, but once they were in between the lines, England now had extra short passing options to penetrate further. Rashford’s directness in possession and his ability to beat players one on one also helped England penetrate, while Lingard’s movements between the lines provided an alternate passing option, should dribbling not be on. Despite all of this, England failed to score against Belgium for the second time at the tournament, as their final-third entries continued to lack accuracy and consistency. With preparations now geared towards the newly formed UEFA Nations League and Euro 2020, there will inevitably be a few dropouts from the squad that went to Russia. Ashley Young, Gary Cahill and Jamie Vardy will all be well into their 30s by the time the next major tournament arrives, with Vardy needing to maintain his goalscoring form in the Premier League to stand any chance of making another plane. Utility players such as Danny Welbeck, Fabian Delph and third-choice goalkeeper Nick Pope are also unlikely to be an active part in future squads, unless their club form dramatically improves within the next 18 months. Another major criticism of the England squad prior to this World Cup was a lack of senior tournament experience. In England’s opening game against Tunisia, nine of the starting XI were making their World Cup debuts, while nine of the squad of 23 had never been to a senior tournament with England before. There is no doubt that England will head into Euro 2020 and Qatar 2022 in much better shape in terms of experience, but we can expect to see fresh young talents emerge who have not yet established themselves at club level. 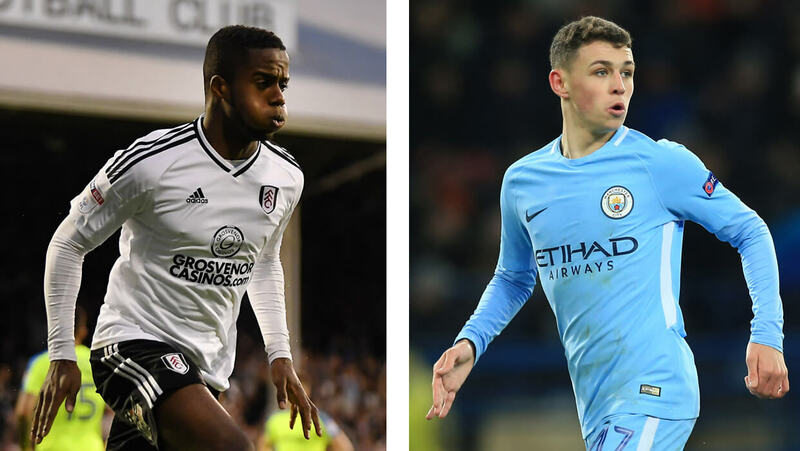 Borussia Dortmund attacker Jadon Sancho, Fulham’s exciting Ryan Sessegnon (above, left), the Manchester City pair of Phil Foden (above, right) and Lukas Nmecha and Chelsea prospect Mason Mount can all push for places given proper runs of top-level football. For all his form (and possibly fitness) tailed off in Russia, Golden Boot winner Harry Kane will continue to be central to Gareth Southgate’s plans. Youngsters already in the squad – Dele Alli, Trent Alexander-Arnold, John Stones, Ruben Loftus-Cheek, Raheem Sterling, Harry Maguire and Marcus Rashford – should all progress and have prominent roles to play, while slightly older campaigners such as Jordan Henderson and Kyle Walker are very likely to be retained. This is a squad that can undoubtedly develop and progress, meaning the future is surely, for once, bright.